The innovative perspective set forth in Dora Hanninen’s A Theory of Music Analysis: On Segmentation and Associative Organization can be glimpsed in its very title. The title proper states the scope of the project at hand: this theory is not a theory of any particular technique, composer, or body of music, but of the practice of analysis—which here seems to encompass any committed, particularized thinking about any piece of music—construed broadly. This immediately evokes one of the most conspicuous of the book’s virtues: in order to accommodate the theory’s generality, the specific analytical tools proposed are almost infinitely flexible. The subtitle, “On Segmentation and Associative Organization,” states implicitly what the book will soon make explicit in great detail, that the act of forming and relating segments is basic to analysis in this most general sense, independent of any particular repertoire, analytical technique, or governing theory. The title further suggests a motivation for the book: the process of forming and relating segments, despite the fact that it is basic to music analysis, is complex, and worth addressing directly. The result is a challenging but rewarding reimagination of analytical practice with insights and implications for almost every music analyst. A brief analytical demonstration will present some of the issues involved. Example 1 presents 24 notes. It also presents the opening of a piece of music called Composition for Four Instruments, by Milton Babbitt. (1) Surely, an understanding of those 24 notes as part of the larger whole is dependent, at the very least, on understanding them as more than just 24 isolated events, but as members of various groups that relate to each other in various ways and that themselves, eventually, compound into even larger groups. But an attempt at isolating the segments in this passage leads to numerous, conflicting possibilities for how this process might unfold. Example 2 presents the passage’s trichordal array. This perspective highlights registrally distinct (014) trichords, their combination into hexachords, and the division of the whole passage into two aggregates. However, if we instead proceed from the presumption that silences define segment boundaries, we get a somewhat different perspective. The first trichord, as in the trichordal array analysis, is set apart from the rest of the passage by the rest that follows it. But continuing to follow the pattern of notes and rests, one would also be led to understand segment boundaries between G and D and D and F in measures 5 and 6, isolating D and F at the end of the first aggregate. The second aggregate presents a similar conflict between segmentations: rests separate the first aggregate from the second aggregate and the first pair of trichords of the second aggregate from its second pair, but two further rests appear in measure 8, isolating D in measure 8 and G in measure 9. There is an underlying relation to the trichordal array—rests follow the last-stated note of every trichord in the array—but, generally, tracking sounds and silences leads to a very different segmentation than that indicated by Example 2. 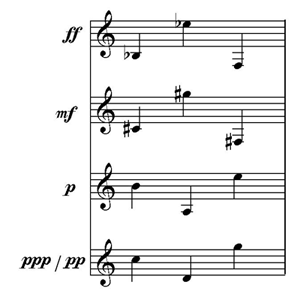 From the perspective of articulation, the long slur over the first six measures divides the passage into two, the first six measures separated from the last three. This coincides precisely with the division of the passage into two aggregates, but one is left to wonder about role of the second slur, over E and C across measures 7 and 8, which does not encompass any significant segment of the array (though see Mead 1994, 69 for further discussion of it). Finally, there are two further ways in which the second aggregate can be segmented into equivalent trichords. In terms of temporal ordering, the aggregate divides into four (013) trichords, as shown in Example 3. Tracking each dynamic level separately, as shown in Example 4, divides the passage into four (027) trichords. We learn three things from this demonstration that Hanninen’s A Theory of Music Analysis is well equipped to help us understand. First, as Hanninen points out, “association can itself be a rationale for segmentation” (7). For instance, relatively little about the music puts forth dividing the second aggregate into temporally discrete trichords, as shown in Example 3, but the repeated recurrence of equivalent (013) trichords makes this a plausible option. Hanninen’s choice to address segmentation and association within the same treatise thus appears quite logical. Secondly, various possible distinct patterns of segmentation and association coexist in the same passage, and it is far from evident how or even whether one should prioritize among these patterns. Even if we do eventually want to choose among them, one wants—and Hanninen provides—analytical tools sufficiently flexible to encompass these various possibilities. Finally, the various segmentations coexist not just because they result from paying attention to different things, but because they result from paying attention to different kinds of things. Tracking patterns of rests or articulation, for instance, is a very different sort of observation than following the piece’s trichordal array. The unraveling of that array requires knowledge and experience in a way that simply recognizing the local repetitions of (013) in the second aggregate does not. Accordingly, the first step in A Theory of Music Analysis is to distinguish between the different “domains” of musical experience that affect segmentation and association. The schematic in which Hanninen presents these domains and the interrelationships between them that will form her theory is presented in Example 5. As can be seen in the schematic, Hanninen’s theory presents three domains—“sonic,” “contextual,” and “structural”—each coupled with an “orientation,” and a series of five “levels” that proceed, successively, from “conceptualization” toward the “music.” The sonic domain, appearing on the left side of the schematic, is the first she discusses. As shown in the schematic, the sonic domain is defined by its “disjunctive” orientation. The disjunctive orientation responds to relatively large differences in some musical dimension. In Example 1, for instance, the leap between C4 and D 5 in measures 1–2 is by far the largest leap in the piece at that point, effecting a disjunction in the dimension of pitch and thus defining the first three notes as a segment. This coincides with a leap in dynamics, confirming the segmentation of the first three notes. This orientation also allows for the segmentation of temporally distant notes grouped according to some shared attribute. Examples 2 and 4 each provide instances of this: the trichords of Example 2 are defined by registral proximity, while those in Example 4 are defined by shared dynamic. 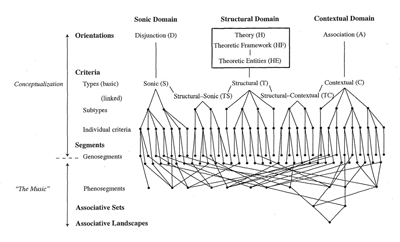 The sonic domain, in which segments are defined by disjunction, corresponds to a great deal of psychoacoustic scholarship on segmentation, and Hanninen’s discussion of it makes frequent mention of scholars in this field. However, Hanninen distances herself from the scientific approach in favor of an interpretive, “humanistic” conception of analysis. (2) Because of this, the process of choosing between various possible sonically-defined segmentations is not explained using a predictive algorithm or in reference to empirical studies, but rather is left to the interpretive preferences of the analyst. Among other consequences, this results in the position that the relative importance of any particular sonic dimension “is influenced by musical context and individual judgment” (260). Context also determines the second, “contextual” domain of Hanninen’s theory. As can be seen on the right side of the schematic, the contextual domain is defined by its “associative” orientation. Simply, this domain encompasses situations in which segments are related because of one or more shared features. The possible shared features that can create associations are left completely open, encompassing all musical dimensions. Further, as noted above, association not only relates segments but can also define them. Nonetheless, most perceived segments are also defined by sonic criteria, and thus the sonic and contextual domains, though addressing opposite mental processes, often work in concert. Central in Hanninen’s schematic, but considerably less central in her theory than the contextual domain, is the “structural” domain. The structural domain concerns “theories of musical structure” invoked in the process of analysis that define “theoretical entities,” and thus segmentation, within their own “framework.” Hanninen describes Schenkerian theory and twelve-tone theory as paradigmatic examples of structural theories that suggest particular segmentations, but her use of the domain is surprisingly flexible, seemingly encompassing any preexisting framework affecting segmentation that an analyst might bring to a piece. Among the more curious criteria for segmentation or association described as stemming from the structural domain include the chorale melody “Es ist genug” in Berg’s Violin Concerto (211), canonic patterns in Nancarrow’s Study no. 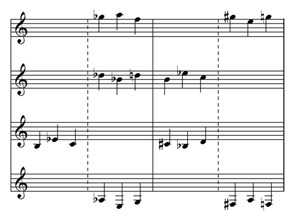 37 (291–308), and Robert Morris’s compositional designs in his Nine Piano Pieces (360–400). These make for a group of criteria probably not commonly understood as results of “theories of musical structure,” but they are united by their common origin: each can be considered as conceptually prior to, or at least distinct from, the piece under examination. This origin distinguishes the structural domain from the sonic and contextual domains, which are entirely defined by the piece at hand. The structural domain is also, uniquely, expendable: not every piece suggests the presence of a governing theory, and segmentation and association in these pieces can be analyzed entirely using the contextual and sonic domains. Continuing down the schematic, we see that each of the various domains define “types” of criteria for segmentation. At this point, the precise number of lines and nodes in the schematic becomes metaphorical: there are an infinite number of possible individual criteria in each domain, limited only by an analyst’s interests and needs. Individual criteria each define “genosegments.” A genosegment is a segment defined by precisely one criterion, whether or not a listener is inclined to perceive it as a discrete segment. A “phenosegment,” on the other hand, is a “readily perceived” segment of music. If a segment is indeed readily perceived, this perception is surely fostered by at least one criterion distinguishing it from its surroundings, but most phenosegments are in fact defined by multiple, various criteria; this explains the tangle of lines connecting genosegments and phenosegments in the schematic. The terms genosegments and phenosegments, adapted from the genetic concepts of genotypes and phenotypes, constitute the first of many metaphors Hanninen draws from the biological sciences, of which more below. After the introductory overview of Chapter 1 and the preliminaries about “Orientations, Criteria, Segments” of Chapter 2, Chapter 3—much the longest of the opening theoretical chapters—addresses the heart of her analytical method: “Associative Sets and Associative Organization.” As the title of this chapter suggests, the focus here is squarely upon the contextual domain. “The contextual subschematic,” she writes, “is the theoretic and analytic focus of the book” (416). Chapter 3 introduces the concept of the “associative set,” a set of segments bound by one or more shared criteria. (There is room for confusion here: an associative set is a set of segments, not a set of notes or abstracted notes, as in a pitch-class set.) The ensuing extensive discussion encompasses the ways in which human cognition constructs relationships within and between associative sets, along with a number of creative ways to visually represent various aspects of associative organization. The most important of these are the “associative landscapes,” which depict the arrangement of associative sets over the course of a piece. Excepting a final chapter on possible extensions of the theory, the remainder of the book is analytical. A chapter each is devoted to the first movement of Beethoven’s Piano Sonata op. 2, no. 2, Debussy’s Harmonie du soir, Nancarrow’s Study No. 37, Riley’s In C, Feldman’s Palais de Mari, and Morris’s Nine Piano Pieces. In each of the analyses, the goal is the construction and examination of models of associative organization, with careful attention to the interaction between associative organization and the piece’s style and compositional techniques. Though the variety of pieces discussed means that each analysis is distinct, the analysis of In C represents a particularly extended application of the theory. 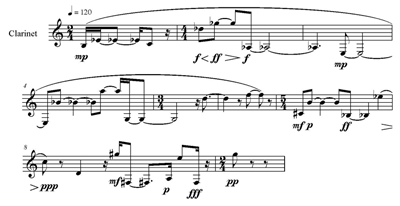 Given the indeterminate score of In C, Hanninen first analyzes the associative organization of the piece’s fifty-three repeating figures themselves, before proceeding to discuss the ways several different performances effect distinct interpretations of that organization by emphasizing, obscuring, or creating associative links between various aspects of the piece. In this, we see that associative organization is not simply a fact of a piece’s score, but the result of an actual musical experience; a creation of performers and listeners as well as composers. Though Riley’s composition provides an extreme example, the principle holds broadly. As the list of analytical chapters suggests, the book’s examples are drawn primarily from twentieth-century music. Hanninen gives two reasons for this, correctly noting twentieth-century music’s exceptional diversity, including diversity of associative organization, and that it is generally less well understood than earlier music. Accordingly, one of the stated goals is to propose a “general theory of musical form that goes beyond named forms . . . to support the study of forms without names, prevalent in twentieth-century and contemporary music” (16). I think one could go a bit farther than this. Her theory is especially well suited to atonal (and non-twelve tone) compositions not just because it can reveal their idiosyncratic associative organizations, but because of the special role and importance of association in much of that music. In a great deal of atonal music, associative flexibility and multivalence, the sense that any given segment is associated multifariously with numerous other segments, is a primary driver of musical interest and expression. Perhaps the music for which this is most true is that of Morton Feldman, and its frequent appearances in Hanninen’s work yield some of her most compelling analyses. Indeed, of the many engagements and reengagements with music both familiar and unfamiliar in A Theory of Music Analysis, none were more revelatory for me than the new hearings of Feldman that Hanninen inspired. Her analysis of Palais de Mari captures the momentary subtleties of the piece’s complex associative patterns while providing striking insight into how the piece—perhaps surprisingly—can be construed as projecting a large-scale formal narrative. One lament I have about the book regards the quantity and quality of material buried in the endnotes. Often, a name or topic from the body of the text will receive an endnote with not only a citation, but also a quotation from the original source that sheds new light on Hanninen’s project. There are two subjects in particular that, though mentioned in the body of the text, receive new importance in the endnotes. The first of these subjects is the central set of metaphors of the book, those drawn from the biological and ecological sciences and from philosophies of those sciences. We have already seen this in the terms “genosegment” and “phenosegment,” and several other terms similarly carry biological or ecological resonances, but the importance of this metaphor goes far beyond the terminological. The whole apparatus of associative landscapes—the preeminent analytical tool of the book—is inspired by the field of landscape ecology, and the theoretical discussion of associative landscapes includes numerous citations of ecologists. An extensive metaphor is established in which an associative landscape with its associative sets and their segments is compared to an ecological landscape populated with species and organisms. The second subject that receives new importance in the endnotes concerns Hanninen’s primary meta-theoretical influences, which include David Lewin, Joseph Dubiel, and particularly Benjamin Boretz, as well as others affiliated with them such as Robert Morris and Marion Guck. That is, this book fits quite well within the “radical relativist” meta-theory that developed among students of Milton Babbitt in the late ‘60s and afterwards. (4) A core insight of this perspective is that analysis is not explanatory, but ontological. In Hanninen’s words, music must be “constitute[d]” from “sounding events and analytical interpretations” (5). Music’s existence, that is, is a function of a listener’s cognition. As Boretz writes in Meta-Variations, “The very being of music is created by cognitive attributions made by individual perceiving or conceiving listeners. . .” (Boretz  1995, under “Some Background Notes”). Accordingly, the very “sound” of music, for Hanninen, is a result of contextually sensitive attributions made about it (155 and elsewhere). The radical relativist position challenges most traditional justifications for musical theorizing, for it becomes more or less impossible to generalize about music when music is going to be—literally, in the ontological sense, to be—different depending upon any given listener’s particular cognitive input. Hanninen’s Theory of Music Analysis, then, is not a theory in nearly any of the usual senses of the term. It is not explanatory, predictive, normative, or evaluative. While one might use it for interpretation, it is not, of itself, interpretive. Hanninen addresses this issue in the opening pages of A Theory of Music Analysis. She describes her theory not as guiding interpretation, but as an “interpretive tool,” as a “lens that increases the grain of resolution of the analyst’s own interests and choices” (4). By creating a situation, through a combination of close investigation and imaginative representation, in which analysts must carefully reexamine their motivations for particular segmentations and associations, the theory’s effect is not instructive as much as it is consciousness-raising. Her theory thus fulfills Boretz’s promise, cited on the first page of A Theory of Music Analysis, that the human “faculty for imagining and abstracting” can be “mobilized” toward “self-directed sensitization and strength in the service not only of creating our own experience, but of making it more real, making it more substantial, and more particular and specific for ourselves” (Boretz 1992, 339). The increased “sensitization” that Hanninen’s theory inspires, and her repeated reminders of the cognitive status of musical ontology, results in renewed awareness of the degree to which segmentations and associations are chosen by the listener. Having recognized this, one is inspired to make more choices—choices perhaps not fully entertained on a first listening—and thus to expand, complicate, and enrich one’s musical experience. This, in turn, brings us to a final Boretz quotation. That is, by creating a framework in which the task of forming associative patterns becomes affirmatively creative, Dora Hanninen inspires us to find the musical in music. The result, despite all the rigor of her work, is the replacement of “authoritative prescription”—the authority of theories, norms, habits, even unreflective first impressions—with liberation. Boretz, Benjamin. 1977. “What Lingers on (, When the Song is Ended).” Perspectives of New Music 16, no. 1: 102–9. Boretz, Benjamin. 1992. “Experiences with No Names.” Perspectives of New Music 30, no. 1: 272–83. —————. 1992. “Experiences with No Names.” Perspectives of New Music 30, no. 1: 272–83. Boretz, Benjamin. (1969) 1995. Meta-Variations: Studies in the Foundation of Musical Thought. Red Hook, N.Y.: Open Space Publications. —————. (1969) 1995. Meta-Variations: Studies in the Foundation of Musical Thought. Red Hook, N.Y.: Open Space Publications. Boretz, Benjamin. 2000–2001. “Thinking about Theory, Theories, and the ‘Musical’ in Music.” Intégral 14–15: 67. —————. 2000–2001. “Thinking about Theory, Theories, and the ‘Musical’ in Music.” Intégral 14–15: 67. Gleason, Scott. 2005. “(Re) composition at the Edges of ‘Radical Relativism.’” Perspectives of New Music 43, no. 2: 1–44, no. 1: 192–215. Hanninen, Dora. 2006. “‘What is about, is also of, also is’: Words, Musical Organization, and Boretz’s Language, as a Music, ‘Thesis.’” Perspectives of New Music 44, no. 2: 14–64. —————. 2006. “‘What is about, is also of, also is’: Words, Musical Organization, and Boretz’s Language, as a Music, ‘Thesis.’” Perspectives of New Music 44, no. 2: 14–64. Hanninen, Dora. 2009. “Species Concepts in Biology and Perspectives on Association in Music Analysis.” Perspectives of New Music 47, no. 1: 5–68. —————. 2009. “Species Concepts in Biology and Perspectives on Association in Music Analysis.” Perspectives of New Music 47, no. 1: 5–68. Mead, Andrew. 1994. An Introduction to the Music of Milton Babbitt. Princeton: Princeton University Press. 1. For an extensive discussion of Composition for Four Instruments, see Mead 1994, 55–76. Brief comments on several of Babbitt’s compositions appear throughout Hanninen’s book, but the analysis here is my own. 2. “Studies in music cognition and computer modeling can reveal important constraints on the interpretive process, but proceed by tenets (including prediction) and pursue goals that are fundamentally different from those of music analysis as a humanistic endeavor” (236). 3. Much more extensive discussion of biology and its relevance for musical studies can be found in Hanninen 2009. 4. The term “radical relativism” stems from Boretz 1977; see Gleason 2005 for further discussion of this aspect of Boretz’s thought. Hanninen is forthright about her indebtedness to Boretz and other Princetonian meta-theorists in many places throughout her work. Interesting discussions and exemplifications of this aspect of her thinking can be found in Hanninen 2001 and Hanninen 2006. For an extensive discussion of Composition for Four Instruments, see Mead 1994, 55–76. Brief comments on several of Babbitt’s compositions appear throughout Hanninen’s book, but the analysis here is my own. “Studies in music cognition and computer modeling can reveal important constraints on the interpretive process, but proceed by tenets (including prediction) and pursue goals that are fundamentally different from those of music analysis as a humanistic endeavor” (236). Much more extensive discussion of biology and its relevance for musical studies can be found in Hanninen 2009. The term “radical relativism” stems from Boretz 1977; see Gleason 2005 for further discussion of this aspect of Boretz’s thought. Hanninen is forthright about her indebtedness to Boretz and other Princetonian meta-theorists in many places throughout her work. Interesting discussions and exemplifications of this aspect of her thinking can be found in Hanninen 2001 and Hanninen 2006.